Remember that post a few weeks ago where I complained that our heat wasn’t working? Well, it still hasn’t been fixed. Theoretically a repairman’s coming tomorrow, and I won’t have to wear a bedspread around my 40-degree apartment (or escape to Starbucks/the gym for relief). Until then, I’m roughing it. Sort of. On Sunday, the baking urge grabbed me, but the chilly apartment air kept my fuzzy-sock-wearing self firmly planted on the couch beneath two blankets. I kind of wanted to try another batch of molasses cookies, except this time with some cardamom and a little more cinnamon. But I had no eggs, and would have to brave the blanket-less atmosphere required for me to put on shoes — not to mention the outdoors — to walk to the grocery store. It’s times like these that I miss my Mazda 3. Clutching my blankets around me, I walked to the kitchen to see what I did have, and turned up a can of chickpeas. I briefly considered making a batch of hummus, but decided that it would take too much effort. Better to return to the couch as quickly as possible. I preheated the oven to 450 degrees, and just roasted them. It didn’t take too long, and allowed for maximum blanket-covered time. They didn’t even leave crumbs in my lap. It’s probably a pretty healthy snack, if you don’t eat the whole batch in one sitting, but I couldn’t help myself. 1. Drain and rinse the chickpeas. Dry thoroughly in between two paper towels (this lets you use less oil). 2. In a small bowl, toss the chickpeas with the olive oil until they’re well-coated. 3. 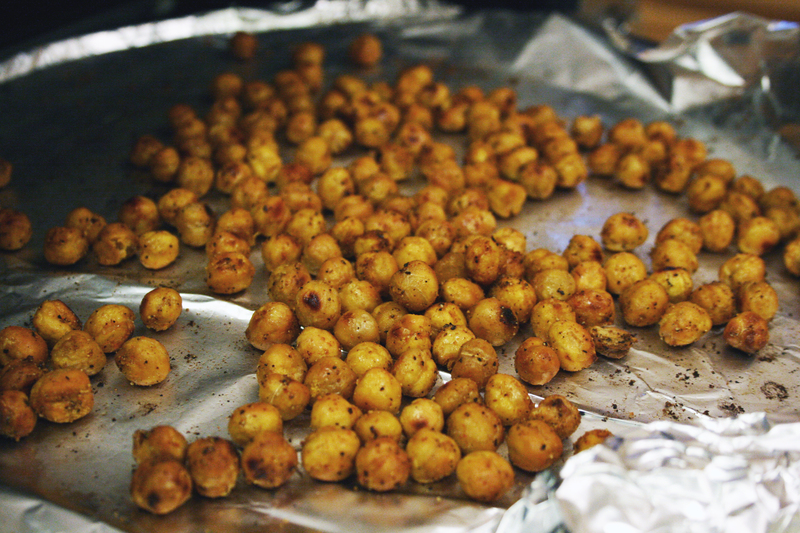 Add the salt and spices to the chickpeas, and toss until they’re well-coated. 4. Spread on a foil-covered baking sheet, making sure they’re in a single layer. Bake in a 450-degree oven for 30-45 minutes, stirring every 15 minutes. 5. Taste and adjust seasoning. Homesickness hits me really hard sometimes, considering I live across the country from most of my family and friends (and both of my poodles). Couple that with my Sandy-related cabin fever, and you get me, in the kitchen for three hours, making as many different taco toppings as possible. I really needed fluffy, fresh tortillas, too, like the ones you can find at any TexMex restaurant worth its salt. So I made those from scratch. This is what I do when I go crazy. Fortunately, the toppings lasted for several days — partly because, in my enthusiasm, I made enough for six people — and I ate them in many different forms: tacos the first night, taco salad the next night, tacos again the day after that, and eventually in quesadillas (pictured above). To make tacos, just put a scoop of everything listed below on a tortilla, roll up, and chow down. Taco salad involves a pile of lettuce with a scoop of everything listed below on top. For quesadillas, place one tortilla on a skillet, spread some beans on it, sprinkle some cheese, spoon on some taco meat, sprinkle more cheese, then layer in vegetables and cheese. Top with another tortilla, and cook over medium heat for 4-5 minutes (watch the bottom of your tortilla — don’t let it burn). Carefully flip and cook for 4-5 minutes more. I spread guac on top of mine afterward. I present to you: my Emergency Tex-Mex Menu. This is the recipe my Mom taught me when I was first learning to cook. It’s based on taste testing, which usually results in my eating half of the bowl before it’s ready. Add chunks of onion, tomato, extra garlic, extra whatever, to taste. I use lots of salt and lots of garlic, tasting as I go. I made this first, so I could eat it while I cooked everything else. With a fork. No shame. 2. Add the lime juice, garlic, salt, and jalapeño. Mix. Taste. Add more ingredients to taste. This is a great site for Tex-Mex copy cat recipes. After finishing the guacamole, I started the tortilla dough, because it has to rise a couple of times. I made the beans and diced the vegetables while these were rising. And ate more guac. And drank some wine. 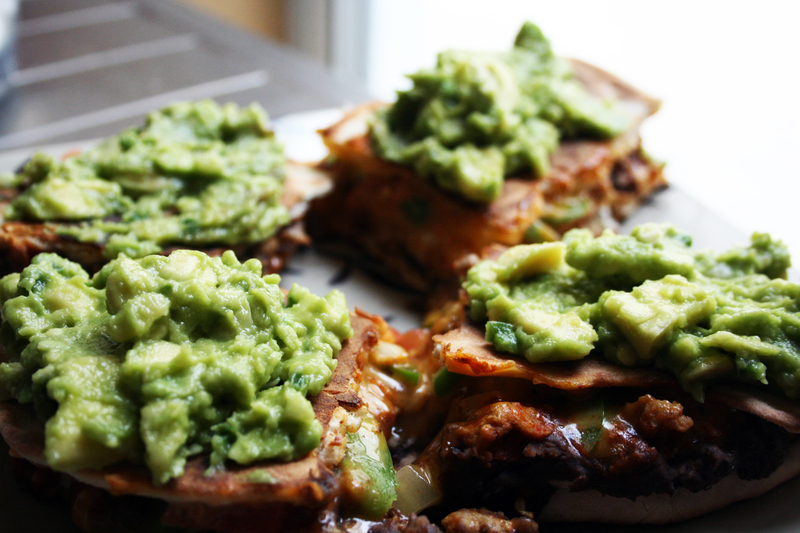 Oh, and these make incredible quesadillas the next day. Something about the way they toast to a crispy golden brown without forgetting to stay soft on the inside. I love, love beans on my tacos. They’re better mixed with some pork fat (aka lard), but you can make a low-fat, easy version here. I puréed everything while the tortillas were rising the first time, then waited to heat it up until I started the chicken meat. Make sure you stir consistently to keep the beans from cooking to the bottom of your pan. 1. Spoon beans into a medium saucepan, reserving juice. 2. Using an immersion blender, purée beans until smooth. Add juice as necessary to achieve desired consistency. 3. Add hot sauce and salt and pepper to taste. I usually make this with ground beef, but was curious about the ground chicken in my grocery store. You could use ground turkey, too. Just grab a taco seasoning spice packet (I think I used this one from Ortega, but really just pick one at the store), and cook according to the directions. I didn’t start this until I finished making the tortillas, mostly to use the same skillet and save on dishes. I diced a white onion, a tomato, and slivered a green pepper. And grated some cheddar cheese! For those of you who didn’t know already, I’m a bit of a wine person. White’s okay, but I love a good sparkling or red. My local wine shop suggested these two blends to accompany a spicy jambalaya I made a while ago. 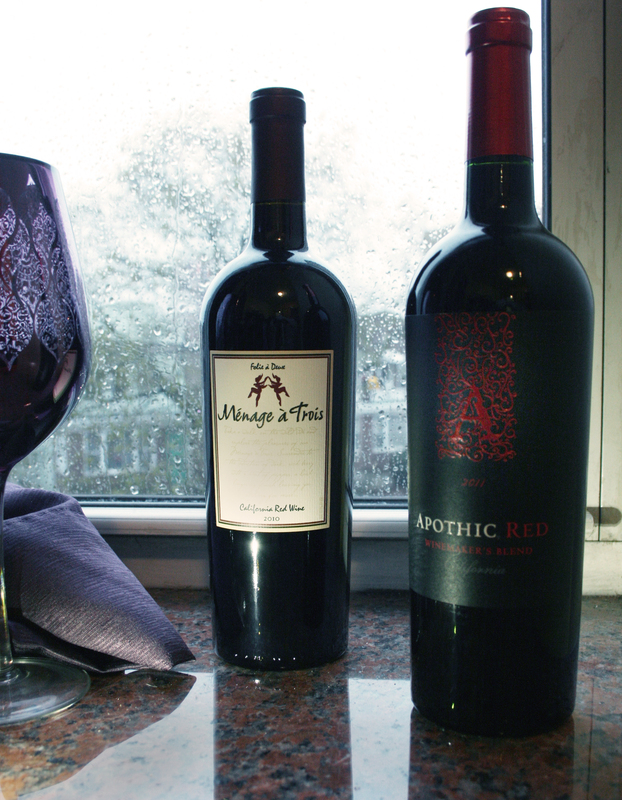 I already knew about the Ménage a Trois, but I hadn’t tried the Apothic Red before. When I heard the news of Sandy’s imminent landfall, I hightailed it back to the shop to buy two more bottles. 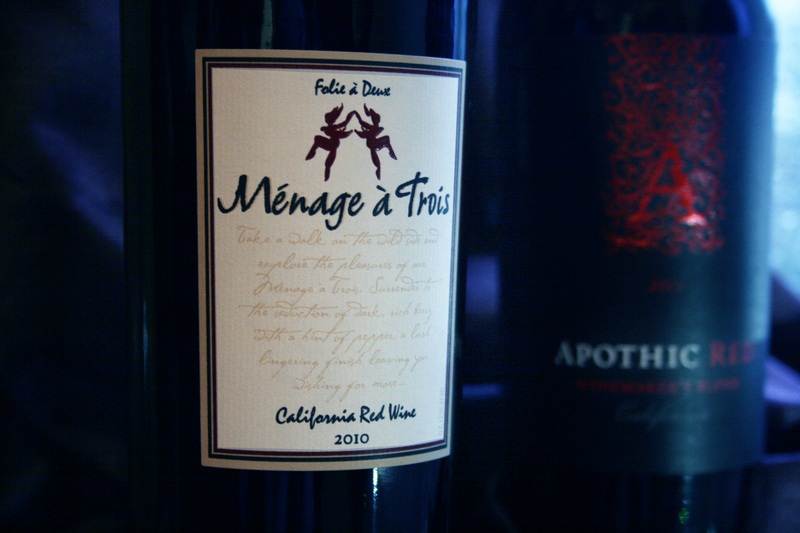 On the left, the bottle of Ménage a Trois; on the right, the bottle of Apothic Red. Hurricane (or was it superstorm by that point?) Sandy rages in the background. Apparently I’m not alone. While hurricane preparation in Texas involves lots of water bottles (which I did buy this time, in addition to my wine), boarded up windows (nobody owns their homes here, so no one has custom-cut plywood for their two story houses), and preventative tree-trimming, hurricane preparation in NYC tends to involve a little water and a lot of wine and gourmet food. Or maybe that’s just the foodie set. Besides hurricanes, both wines are good for a quick weekday night go-to, or for those of us whose palates need a little more than the six dollar bottles at Duane Reade, but don’t really appreciate the more expensive wines yet. The Iced Ginger Cookies, all snuggled up together on a tray. 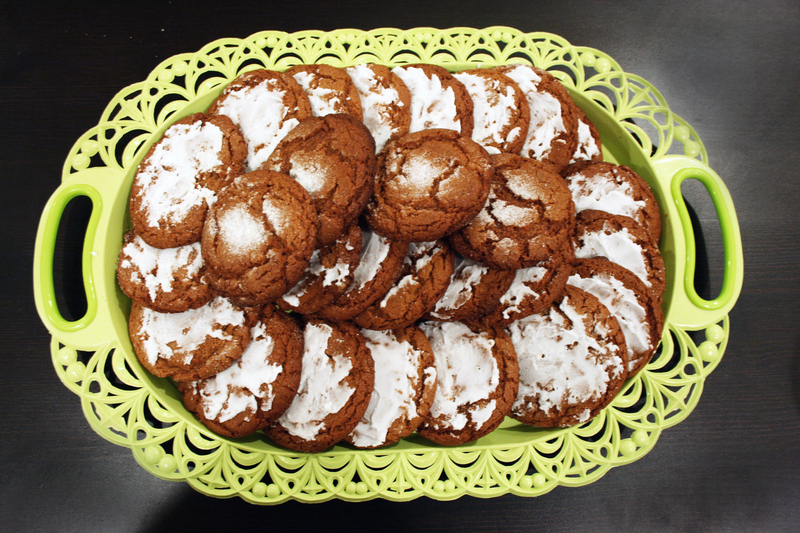 These molasses cookies are seasoned with ginger and cinnamon, then topped with a thin layer of shortening icing. The first time I visited Greenwich Village, back in high school, I remember stopping into the Magnolia Bakery for one of their legendary cupcakes. Although we live near Houston, nothing had prepared us for the city exhaustion (and excitement) New York would bring. A few days into our weeklong trip, we were growing slightly more accustomed to the crowds — but I know that we couldn’t find a place to sit and eat the cupcakes that had beckoned to us from the bakery windows. Of course…we enjoyed them anyway. Fast forward to Sunday night, where I’m sitting in the living room with no more Arrested Development to watch. So I pulled the Magnolia Bakery cookbook off the kitchen shelf and started flipping through it (one of my roommates brought it home for all of us to share, no doubt hoping for baked goods. She knows I’m into food). I wasn’t sure if I wanted to make something, but when I stumbled on the Iced Ginger Cookies (page 53) I just couldn’t say no. They’re definitely a hit with my housemates. I eat one with my coffee at breakfast every morning. Probably not so healthy, but very delicious. (I also eat one as a midmorning snack, one after lunch, and one several hours after dinner). I like this recipe because the cookies aren’t too sweet. The cinnamon, ginger and molasses give them enough spice so I can eat them more than once a day without feeling too sugared. 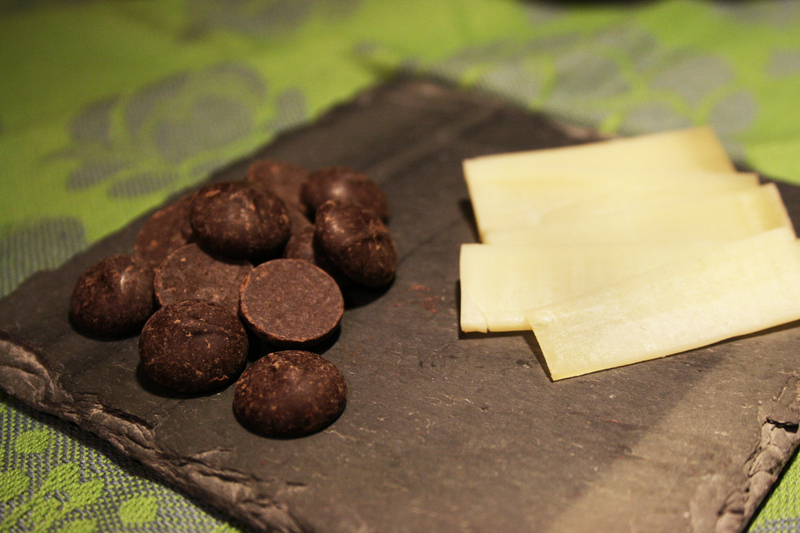 Gruyere cheese with dark chocolate chips. It doesn’t take much to leave me feeling satisfied! Also delicious with a glass of red wine. My other obsession, as those of you who follow me on Facebook will know, is gruyere cheese and chocolate chips. I like to take a little cheese, top it with a chocolate chip, and eat it that way. The saltiness and flavors of the cheese make the chocolate taste richer, I swear! Again, this is a dessert that isn’t too sweet, but is rich enough to leave you feeling satisfied. I tried it with gouda cheese, too — delicious, but the gouda doesn’t go as well with the chocolate as the gruyere did. If you try this, I strongly reccomend that you stick with dark chocolate. I like Ghirardelli’s 60% dark chocolate chips (they’re also my favorite for chocolate chip cookies). Milk chocolate may be too sweet to hold up to the stronger flavors of gruyere. Pair with a glass of mild red wine! I have a post on my favorite wine blends coming up — there are two bottles that I love. Do you have any desserts you’re obsessing over right now? Let me know in the comments below! Okay, so I do realize that you probably don’t read as many food blogs as I do on a daily basis. But even if you just have a Pinterest account and follow people interested in eating, you probably know that butternut squash is simply the thing to eat right now. I had never cooked with the stuff before, so when my recent trip to the Whole Foods produce department turned up a pre-peeled, pre-diced package of fresh butternut, I decided to try my hand at it. I didn’t want to try a soup, because that seemed too easy. I wanted something with protein, something with substance. 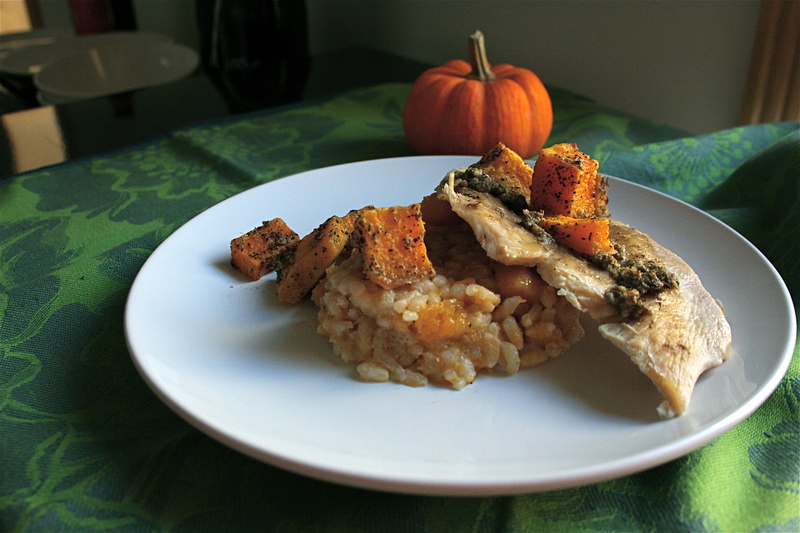 After perusing the foodie internet, I decided to make these two recipes: Butternut Squash Risotto and Roast Chicken with Potatoes and Butternut Squash. I split the package between the two dishes, although I’m pretty sure each dish calls for the equivalent of one squash. I also halved the Roast Chicken recipe, used breasts instead of a whole chicken, and omitted the potatoes. I’m always looking for an easy lunch that doesn’t take up too much time (or money). Usually, that means I throw whatever’s in my fridge on a slice of bread and see how it tastes. Yesterday, after reading through dozens of food blogs for my internship, I was craving something with pear and gruyere. I’d made a pit stop at Whole Foods the day before (I’m trying out alternative grocery strategies, since the options in Brooklyn are continually disappointing), and happened to have everything I needed. No, really, I do keep shallots around. I’m in a bit of a shallot phase right now. Whole Foods happened to also have this Baby Butterhead Lettuce from Gotham Greens that was too beautiful to resist, especially after the pathetic produce that I’d become accustomed to at my local store. Funny that it’s actually grown and packaged in Brooklyn, but I have to make the trip to Manhattan to find it. Anyway, I gave it a simple balsamic dressing and topped it with a little more gruyere. Filling, healthy, satisfying, seasonal, and affordable. So many good adjectives. 1. Combine vinegar, olive oil, salt, pepper, and basil in the bottom of your salad bowl. Whisk with a fork. 2. Tear lettuce and place in bowl. Toss. Top with Gruyere. 2. Melt butter in a skillet, and wait for butter foam to subside (the little bubbles to go away). Sauté shallots in butter until caramelized, about 4-5 minutes. 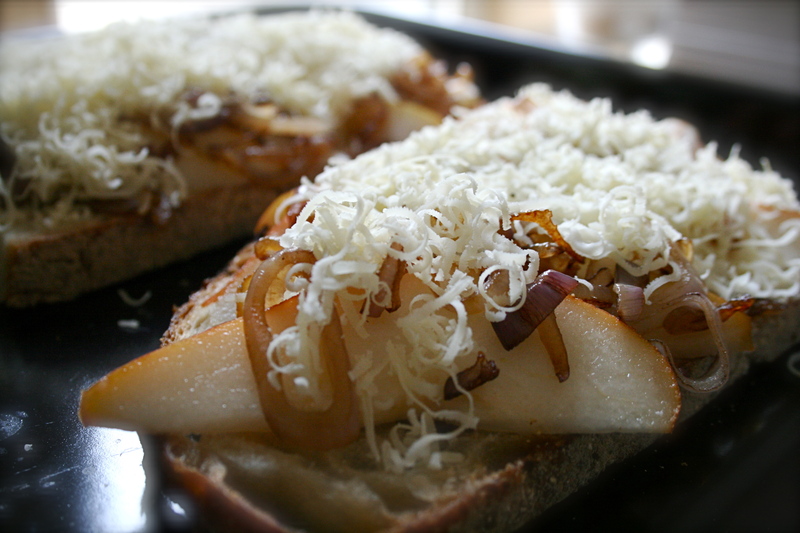 The pear, shallots and cheese sat happily on the bread just before I stuck them in the oven. 3. Place bread on a baking sheet. 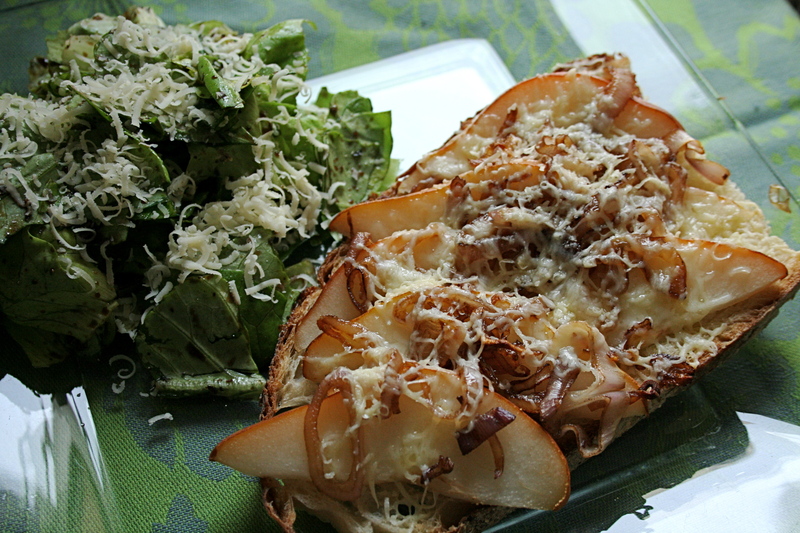 Arrange pear on top of bread. Spoon shallots over pear. Top with Gruyere. 4. Bake for 8-10 minutes, until Gruyere is melted. Our landlords aren’t turning on our heat. For some of you used to the weather up here in the northeast, maybe it’s not such a big deal. But for someone like me, who’s spent her life on either the Mediterranean or Gulf coasts, night time temperatures below 60 degrees require a furnace. I sleep beneath two comforters and six blankets, in sweat pants and a sweat shirt, with a heating pad — that’s how bad it is in my bedroom. No one else in my house seems to have an issue with it, for some reason, but it is a serious problem for me. I called the landlords yesterday, and they promised to look into it. Nothing has changed so far. In the evenings, I cuddle up with a couple of blankets in front of my computer to try to distract myself. It was on one of these chilly nights that I decided I needed a caffeine-free hot drink. I didn’t have any Ovaltine, so I decided to try my hand at a homemade hot chocolate (I do always keep several chocolate bars and a bag of dark chocolate chips lying around. They’re very important to my daily sanity). This recipe is a little funny — the first night, I just drank some of it straight. It’s a very rich blend, undiluted. Today, I added a little bit of milk to a scoop of the “base,” that is, the leftovers from the first night, then reheated it all on the stove. I think that it might be very tasty if the base itself were reheated, then mixed with a little Guinness or some chocolate liqueur. 1. Combine all ingredients in saucepan over medium heat. Stir until all chocolate has melted and mixture has thickened slightly. Pour into a mug and enjoy. 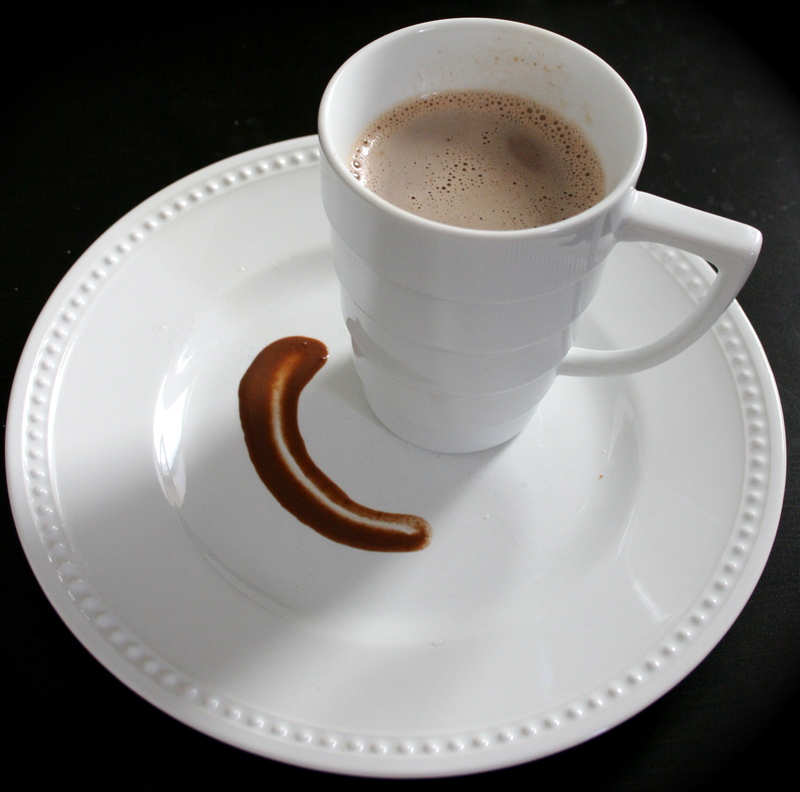 With Chocolate Liqueur: pour 1/2 the batch into a mug, then top off with 2 oz chocolate liqueur and stir until combined. With Extra Milk: pour 1/2 the batch into a saucepan, then add 1/2 a mug full of milk. Stir until mixture is combined and hot.